It’s time for another post for The Kids Cook Monday, our chance to show how children can help in the kitchen and make meals more of a family time. 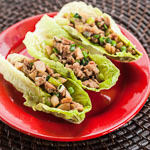 For more information on how to start cooking with your whole family, visit The Kids Cook Monday website. 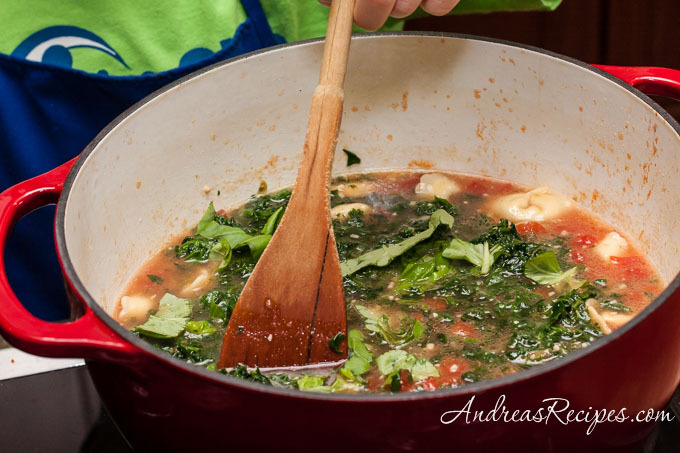 This particular soup is easy, I mean really easy; a perfect soup for the kids to help make. We were very proud that Builder Guy, our 8-year-old son, made this almost completely by himself, and he was proud of his work, too. 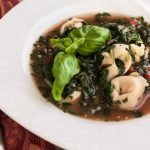 The ingredients are pretty easy to find in many grocery stores, though we keep a couple small pots of basil growing in our home throughout the winter because some days we just need a little burst of summer flavor. As for the cheese, I specified Grana Padano, which is similar to Parmesan cheese, though it’s aged for a shorter time and costs a little less. We’ve been using it regularly for the last couple of years, and your local stores may carry it, too. If not, Parmesan will work just fine. Though Monkey Boy only liked the pasta, both Top Gun and Builder Guy gave the soup two thumbs up and asked for seconds, so that’s a winner in our book. 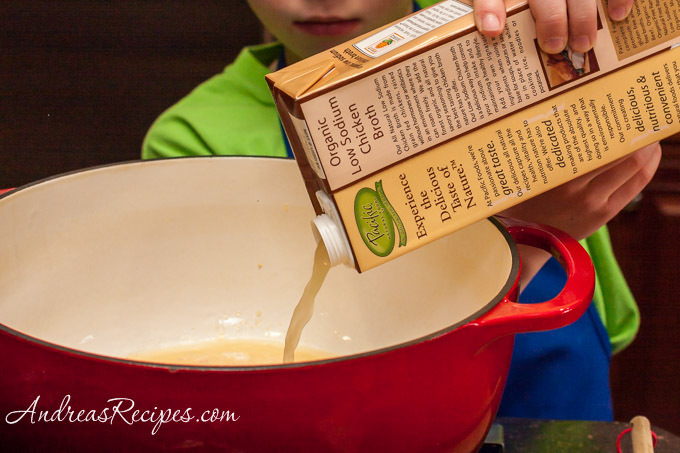 Here’s how to make the soup, as demonstrated by Builder Guy, age 8. Melt the butter, sauté the garlic, then add the broth and bring to a boil. 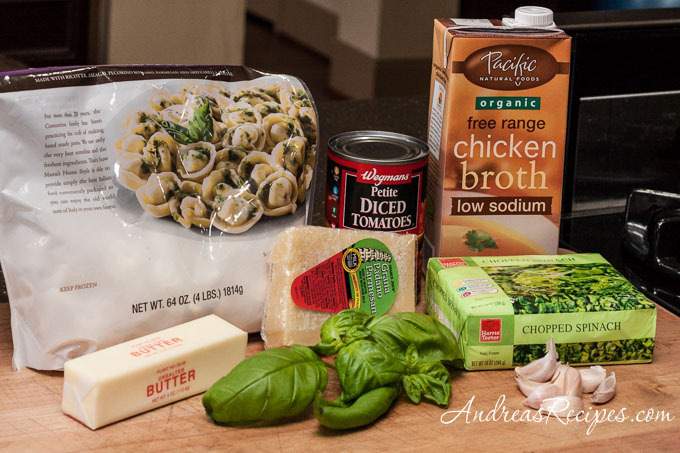 Add the tortellini and cook until it’s about half done. Add the tomatoes and simmer. Add the spinach and basil. Stir, and it’s ready in about two more minutes. Demonstrate and assist with any tasks that might be new: measuring, stirring, pouring, chopping, opening cans. Assign the simpler tasks, such as pouring and stirring, to the younger kids, and save the more challenging tasks for the older kids and adults. Young children should not handle sharp knives or hot pots. Make sure an adult or older child or teenager does the chopping. The broth in the pot will be hot, so be careful when adding other ingredients and watch for splatters. 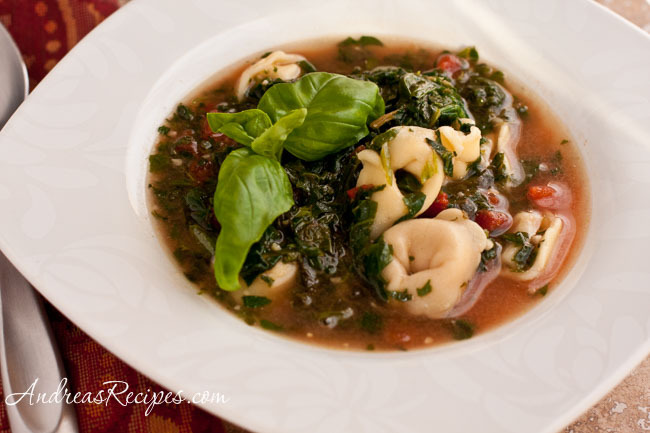 Update: Thanks to Parade and Dash Recipes for featuring this soup! 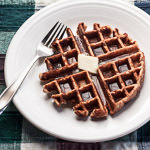 Part of The Kids Cook Monday series. In the pot, melt the butter and sauté the chopped garlic until fragrant, about 2 minutes. Add the chicken broth and cheese rind and bring to a boil. Add the tortellini and bring back to a slow boil, cooking the tortellini until it’s about half done, about 5 minutes for frozen, less for fresh. 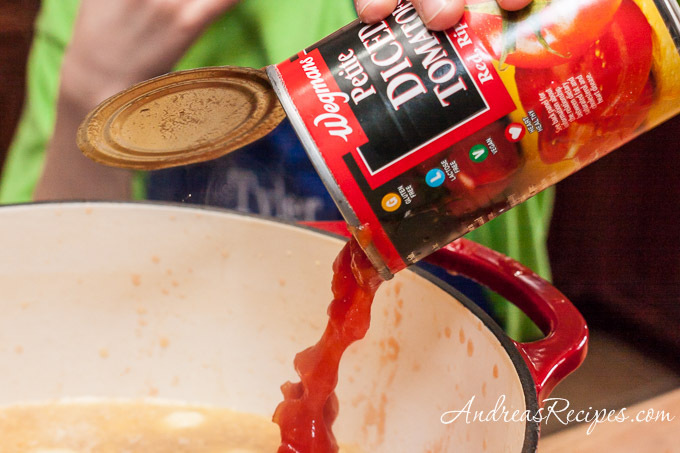 Add the tomatoes and liquid, reduce the heat and cook at a simmer until the pasta is tender, about 10 minutes. 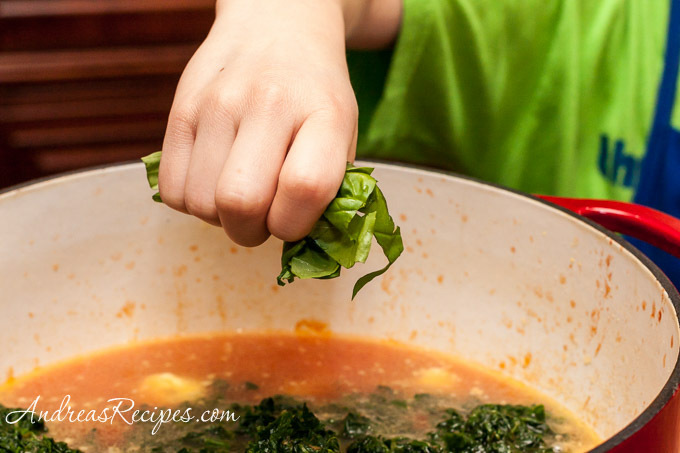 Add the chopped spinach and basil and cook until the leaves wilt, about 2 more minutes. 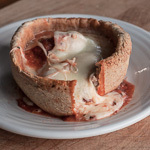 Ladle into bowls and garnish with grated Grana Padano or Parmesan cheese. What a beautiful soup! Your son did a great job. 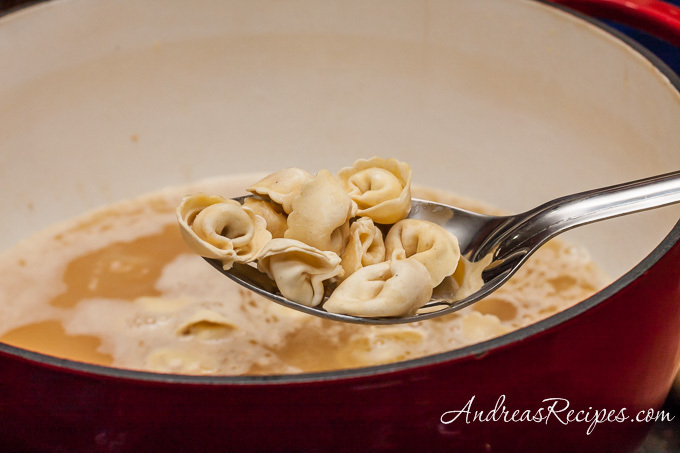 What kind of tortellinis do you use? I’ve never seen them in a bag that big. Thanks!